We will create a platform in which communities will have ready access to toilets and take ownership of their sanitation needs. Burra Naga Trinadh hails from Visakhapatnam, India. He finished his undergraduate degree in Business Management from GITAM Management Studies and then completed post-graduation in Rural Management from IRMA, Gujarat. He has authored 2 books and writes guest columns for the Hindu Business Line. He has close to 8 years of work experience in the development sector (child protection, sanitation, skill training, migration, agriculture) and has worked in India, Indonesia, and Bangladesh with UNICEF, ILO, The Commonwealth, and others. He was awarded a Gold medal for the best All Rounder during his graduation. He was selected as one of the young leaders to the inaugural UNCTAD Youth Forum 2016 and also the World Bank Youth Summit in 2017. He is currently studying for a Master’s degree in Public Policy at the Lee Kuan Yew School of Public Policy, National University of Singapore. Nay Lin Tun - Nay Lin Tun is a Master in Public Policy Candidate at the Lee Kuan Yew School of Public Policy (LKYSPP), National University of Singapore. In LKYSPP, he is currently a President in Helping Hands Volunteers Group and Secretary in the Association for Public Affairs. As for his professional career, he is working as Intern in APLMA (Asia Pacific Leaders Malaria Alliance) and currently involving in developing Malaria policy paper for countries in Greater Mekong Region. He received his M.B,B.S from University of Medicine(2),Yangon and Dual Masters ( MBA & MPA ) from Aldersgate College, Philippines. He is interested in policy analysis and effective implementation of policies. Philip Lu - Philip Lu is a recent graduate of the Lee Kuan Yew School of Public Policy (LKYSPP), National University of Singapore, and the School of International and Public Affairs (SIPA), Columbia University, where he received a dual Master in Public Policy and Master of Public Administration degree. He has served as a Directorate Resource Assistant Fellow at the United States Department of the Interior where he created a monitoring and evaluation framework for urban conservation. He received his BA in Environmental Studies from Brandeis University as a Stoneman Scholar. Team will focus in one school in Vizianagaram District, India instead of the 10 schools which were the initial target. + Vizianagaram District was declared "open defecation free state", use this!! There are toilets at the school, but non-functioning (locked) as the school doesn't have the resources to keep them working and clean. Team will start a crowdfunding campaign. Main task now is assign activities to members of the team and start working on them. We'll re-check the actions at our next meeting. The mission of Raahatis to eradicate open defecation and provide safe sanitation in urban slum communities by Innovating in management of community toilet complexes, and Sensitizing people on good sanitary practices. We searched NGOs and organizations working in India via networks from Geneva. We brainstormed IEC things for behavior change approach. Mentor from WHO shared some poster samples but we can't use it because our project location is limited on water resource.Therefore, we have to develop waterless hand washing poster. ●First type is found in numerous public places, such as gyms, restrooms and stadiums. But , this type is not okay for our targets because in our literature search,, many school children have fallen ill because they consumed alcohol-based sanitizer right from the dispenser. In addition, these alcohols tend to be harsher on the skin causing the skin to dry out and crack, even develop rashes. People who use hand sanitizer frequently, are particularly prone to these problems. ●Therefore, we prefer to use a hand sanitizer made from natural plant oils. A patented process combines lemon grass oil with other plant oils to create an acidic mixture. While not harmful to humans. Not only it has a “devastating” effect on bacteria but also it is as effective as alcohol sanitizer, but they are safer. ●Hand sanitizers kill 99.99 percent of germs on users hands. Regardless of the type of hand sanitizer, proper use of the product will ensure maximum effectiveness. Only about a dime-size amount of the solution is needed. ●Users should massage their cuticles into their hands, then rub the solution over their hands and palms. The entire process should last 10 to 15 seconds. 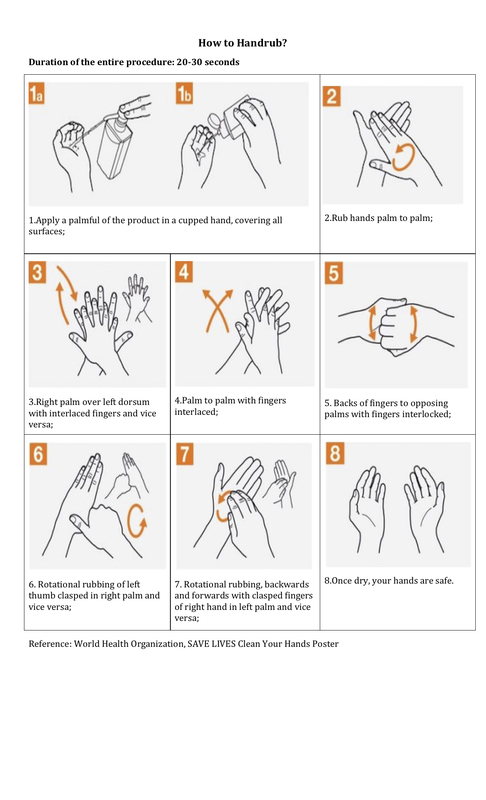 ●Hand washing has been proven to be one of the best ways to prevent infection. Hand washing can be done with soap and water or the waterless hand washing product with an alcohol base. The goal of hand washing is to remove dirt and germs from the hands so urinary equipment is safer to use. Develop survey and share to partner.